As a parent who is sending your child, perhaps for the first time, to summer school abroad, you naturally have many questions. These often range from student safety and what types of activities your child will participate in, to what they will learn and who they will meet. Here we have gathered together some of these questions and provided answers that will help reassure you as you prepare your child for summer school. The Brillantmont summer school programme runs from July 5th - August 16th. Children may attend anywhere from two to six of these weeks, always arriving and leaving on Saturdays. Switzerland is one of the safest, most secure nations in the world. This is why thousands of parents from abroad send their children to study here every year. At Brillantmont, nestled in the middle of the Romandie, French-speaking region of Switzerland, our summer school teachers live with the students and are thus able to offer constant supervision and support. Because of the small size of the school, teachers get to know each child individually and can make sure they are integrating well into the programme. We also have an on campus health service which operates 24 hours a day. In case of emergency, a hospital is located just 5 minutes from the school. Our excursions are led by experienced guides and we always have plenty of staff along on trips to make supervision easy. What activities will my child be involved in? We have a diverse selection of professionally organised activities planned for this summer! Every afternoon we have an ever changing schedule of sports activities including tennis, basketball, trampoline, ultimate frisbee, volleyball, and even Zumba. When the weather is particularly hot, our students enjoy windsurfing, banana boating, and stand-up paddle on the lake. We also organise a weekly disco and barbecue as well as evening activities such as cinema outings, quiz nights, basketball tournaments, roller-blading, and bowling. What is the weather like in Switzerland? The summers are usually quite warm, around 25 degrees. However, since we are in an alpine region, it is advised to prepare for changes in weather patterns. At times the temperature goes up to 30 degrees or drops to cool levels in the evenings or at higher altitudes. Will my child be able to explore Switzerland while on the programme? Yes! We take the whole school on excursions every Sunday. Recently these trips have included visiting caves in Vallorbe, exploring underground salt mines in Bex, rock climbing and glacier walking in Arolla, mountain karting in Morgins, and hiking to the Moiry dam. In addition, we take students to cities around Switzerland - Geneva and Berne to just name a few - to experience the urban landscape of the nation. Do the activities repeat over the six weeks? No. Our activities, classes, and outings are continually changing. Those students attending the full six weeks will have the opportunity to experience a wide variety of excursions that never repeat. Will my child learn any skills besides the language being taught? Yes! Students will have the opportunity to develop their multicultural skills, engaging with children and staff from all over the world. They will also be introduced to the boarding school lifestyle where they will begin to learn what it means to live in a community away from home. They will begin to build independence and a new sense of self-responsibility. What kind of students will my child meet while at Brillantmont? Our programme this summer will be welcoming students from 30 different countries! Your child will be able to make lasting friendships with students from across the globe. 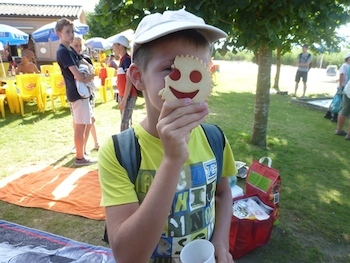 What role does language learning play in the Brillantmont summer experience? We offer English and French immersion courses that take place every morning for three hours. Utilising the extensive experience of our language staff, students will split their time between rigorous grammar analysis and practical oral communication. Students often take trips into the city to markets, museums, or the urban centre in order to practice what they have learned in the classroom. How will it be determined which language class my child goes into? When your child arrives at Brillantmont, they are tested in their chosen language and placed into the appropriate class according to their scores. We provide classes at all levels, from beginner to advanced. Registration is now open for this year’s summer school! Space is quickly filling up so reserve a place for your child today! Click here for our information package which includes enrolment details and forms.